edge gate is the simplest type of gate and is used wherever the product can or must be gated from parting line. it's designed commonly for injection machine attended by operator, because the product must separated from the runner system by hand with the aid of side cutter. Runner width and Height for side gate or edge gate is preferred that height is about 0,7-0,8 from width of runner. the width of runner very depending on product size and weight, it from 3 mm until 7 mm in width ( product mass until 200 gram in maximum). Gate width and height is about W=3h,with W is width and h is height (look at Herbert Rees, Mold Engineering, pg 159) but this rule can't applied for all part or product form, specially for thick product that have large in width such us panel and cover, when design the dimension of gate take the rule that height of gate is must about 75 % from the parts thickness, Suggested take 0,6 until 0, 7 from parts thickness, but specially for elastomer material take more large about 80-90 % from parts thickness. 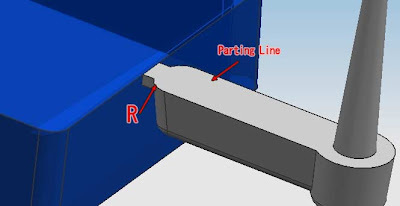 T is gate width, for product mass until 200 gr, suggested take 1 until 5 mm in width , for the very large product some times have width until 12 mm. C is Land of gate from runner, the length is should be no more than 1,5 mm. 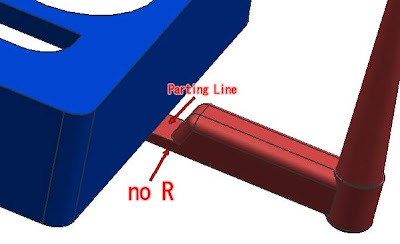 also preferred make taper before gate land, in that picture taper are change with R in both side, make R, taper or not is depend on side gate size and form. both those picture shown edge gate or side gate with different design, application, parting line, taper and R system. 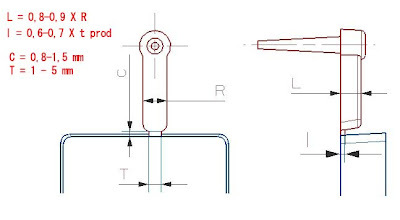 taper from bottom runner to gate land have various dimension, the taper in picture 1A is enough large, about 30-45 degree, in picture 1B taper is about 10-20 degree. beside those type of side gate, they are still various type of side gate or edge gate, will upload in other post.